Ultraviolet rays of the sun are not visible and cannot be felt.The best way to protect your skin is to seek shade when the harmful Ultraviolet rays are at their peak. If you are heading outdoors, you must wear protective clothing, an unbrella or a broad-brimmed hat and sunglasses. Here are a few simple points you need to keep in mind. Plan your day well in advance. Avoid the sun from 9.00 am to 5.00 pm.It is best to wear loose-fitting clothes that cover as much skin as possible. Closely woven fabrics that cast a dense shadow when held up to light are perfect to protect from the harsh sunlight. Protect your eyes. Wear sunglasses that wrap around the sides of the face. The best way to protect your skin is to use sunscreen lotion. A generous application of a broad spectrum SPF 30+ sunscreen would do. Re-apply it every three hours. 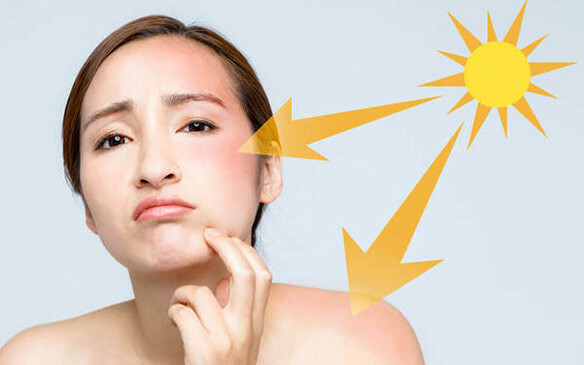 Always apply sunscreen before 20 minutes of stepping out. Rubbing peeled potato skin and applying cucumber on the affected area is also good. Prepare a paste of sandalwood powder, coconut and almond oil, and apply it on your skin for half an hour before bath. Applying aloe vera gel daily also helps. Papaya is a natural skin-lightening agent. Rub papaya pulp on tanned skin.